Moisture is presence of water in different substances. Moisture measurement is critical because it may affect the business cost of the product and the health and safety of the personnel. There are several different techniques of water detection. 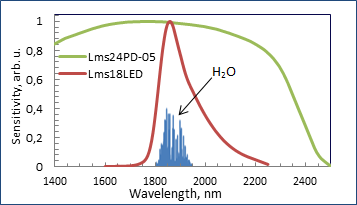 We offer method of optical absorption based on mid-infrared LED-PD optopair. Water has the main absorption band at 1800‒1950 nm (the data are taken from HITRAN Catalogue). We recommend using Lms18LED or Lms19LED LEDs and Lms24PD series photodiode. LED-PD based Evaluation systems for moisture measurement ▪	NEW LA-1t LED Analyser a device oriented for the initial experiments with different liquid (and other) substances, enables defining the absorption properties of the analyzed sample in the spectral range 1.3 – 2.3 µm.